New clients Ed and Charlie were on board with me on Sunday April the 7th, we met up at the lake, launched the boat and headed out, after setting the lines we were under way. The morning was cool but i knew the day was suppose to be a nice day. After a long while one of the back rods was struck hard and the fight was on while Charlie was doing battle and half way to the boat the fish jumped a few times and spit the hook. that would be the only bite for a long while as i kept trying different lures and depths, finally the starboard side back rod was hit and Dan reeled in a nice fat kokanee. we continued on and again nothing, so i kept searching and hour later we had another fish on and we landed another fish. we then made it to an area that looked good and we had another fish on and this time it was a nice rainbow, I continued to work the area and this would make the whole day worth it as we ended the day with five kokanee and five trout from the waters of Don Pedro. A great day with two great days. Thanks again !!!!! Return client Henry brought along his eight year old grandson for a fishing trip again at Don Pedro. Soon after launching the big Willie boat were fishing on this cool and breezy day. It wasn’t long and we had our first strike and after a short battle it was in the net. Then that seemed to be it for a while, so the hunt began I was hoping the fishing would be better as the water was considerable clearer than previous trips and a slight bit warmer. We would finally get another fish however the action was slow, so after along while I made a total change in presentation and it wasn’t long and we began to see a little improvement. The day ended with a surprisingly three kokanee, three rainbows and three small mouth Bass and one lost fish. Thanks so much for coming out again!!!! 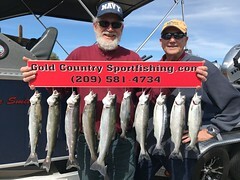 New client Troy brought along three of his friends for a day out on Don Pedro on March the 17th. After launching the boat we started fishing right away and maybe 30 minutes we had a solid hook up and Steve was up first since this would possibly be his first fish, after a good fight just beyond the net the came unbuttoned, we continued to work the area for a couple of fish. After no further action we kept moving in search of……. This day would prove to be another challenging day, with only one lost fish and a few solid strikes they ended the day with four fish… Still better than nothing…. Thanks again guys for coming out… No pictures were taken. Returning client Dan brought three of his friends and one was from South Africa out visiting so he thought what better way to spend the day was to go on a fishing trip. We met up at the lake, launched the boat and headed out. After setting two rods we were on our way and with in less than five minutes we had our first strike that did not stick, we went another 50 yards and the starboard side was hammered so Joe quickly grabbed the rod and we soon had our first fish of the day in my new Reliable fishing bag!! We continued to work the area and not much time went by as we had fish number two in the bag. We had several more good grabs that came up empty. This day would prove to be on the tougher side as we left the area in search of more fish. The first location came up empty and then on to another spot that did produce a single fish for us, so again we picked up on moved onto another location for nothing, so by this time its after lunch so we headed back to our original spot and instantly picked two more fish and we had two other grabs that didn’t stick. These guys had a great time just spending the day together. The days final tally was five fish landed and we had 5 other very good strikes. A great day with guys. Thanks again everyone. Returning clients John and Don and they brought along their friend and fire jumper Kizer for a day’s fishing on Don Pedro. The morning after Christmas was a very cool but mostly sunny day. After launching the boat at 7:30 we set lines and with in 50 feet we had our first hookup of the day and fish was soon in the cooler. We worked this area thoroughly for several fish before moving onto another location that proved to be a successful one and after this spot was worn out we moved back to our first location for 3 more fish and we called it a day. We ended up with 13 rainbows in the cooler and had many missed opportunities and several that was lost. A great day with great guys… Thanks again!!!! 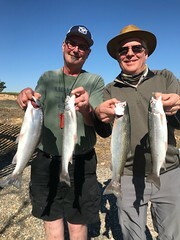 Return and regular clients Dan and Mike were onboard for some trout fishing on Friday December the 21st at Don Pedro. We started a little later in the morning as we launched the boat about 7:30 and started fishing after ten minutes we had our first fish of the day on the line, then soon after we had another and that was it in this spot, so I changed locations only to have just a couple short strikes, so back to the first spot as we boated a couple more, however the spot went cold. A restroom break and we quick chat with a bass fisherman and I headed to a new location and this is where I found a great bite late in the day as we finished off their limits, keeping nine trout, letting one go and had a very big fish on that we never seen, a I think it was a German Brown as they way it was fighting, then we had another big fish but broke the line and a lost lure….. UGH! I stayed later than normal as the fish were biting and I wanted these two to get their fish and we did……. Thanks again for coming out guys. Returning clients David and his wife Gina brought along her 85 year old uncle Arnold for a days trip on Don Pedro. The morning was a cool 35 degrees as we approached our fishing grounds there was a very thin layer of fog on the water, after setting the rods it wasn’t even five minutes in and we had our first fish of the day hooked up and on its way to the net. This day was a great day and these two are always a blast to have onboard and with her uncle being in the Korean conflict and the Vietnam war he had some amazing stories. The action was just crazy all day long and we ended the day with a double hook up. The days tally was 14 rainbows kept, they released a few and some bass was also let go. A great day with great people. Thanks again !!!!!! New Client Paul brought along his family for a batchler party. We met at the lake, it was clear when I arrived at the lake, we headed out and started fishing only to be forced back to the dock due to heavy dense fog, that lasted about and hour and a half, it cleared to a beautiful day, after setting four rods we had a fish right away and that was it for some time as we searched and searched for fish and finally I made the decision to change up tactics and headed for one of my winter time spots and as soon as I set the rods one of the rods was slammed and it turned out to be a three pound rainbow then again we had another, so now I know we found some fish and the fishing turned on for us as the full moon was working against us in the morning hours. 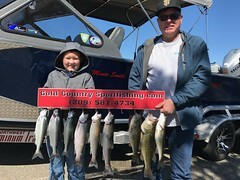 They laded six rainbows with the biggest one being four pounds four ounces, they lost a few and we many strikes where they would hit the lure but miss it, we had to leave them biting as the sun was getting very low in the sky as we headed for the dock. A slow start to the day but ended up pretty good. Thanks for coming out guys!!!!!!!!!!!! !